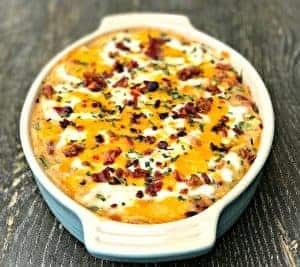 Instant Pot Cheesy Scalloped Potatoes Au Gratin is a quick and easy pressure cooker recipe with gooey cheddar and parmesan cheese. 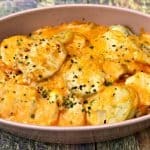 This recipe makes the perfect side dish and is great for weeknight dinners. I have always been well known for making really good potatoes. I used to host an annual fantasy football draft party among my girlfriends. It was sort of like an end of the summer gathering. Football starts in early September. We would usually have our party Labor Day weekend. 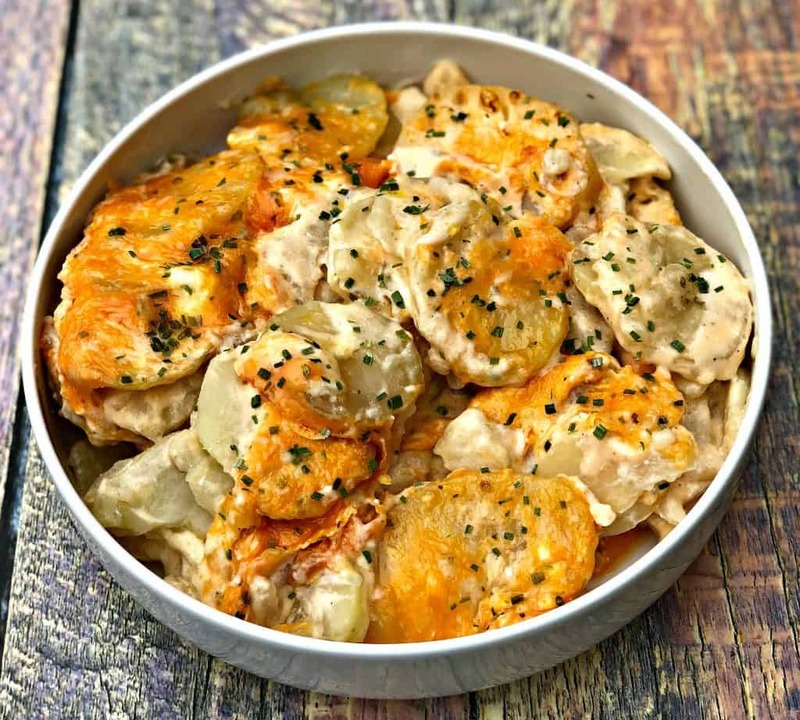 I would grill chicken, burgers, and I always prepared scalloped potatoes. My friends nicknamed them crack potatoes because of how good they are! The name crack potatoes eventually became the nickname for all of my potato dishes. Be sure to check out my Crack Potatoes recipe for creamy mashed potatoes. Back then, I used a flavored Philadelphia Cream Cheese cooking cream. A couple of years into my use of it, Kraft stopped distributing it. I loved that stuff. 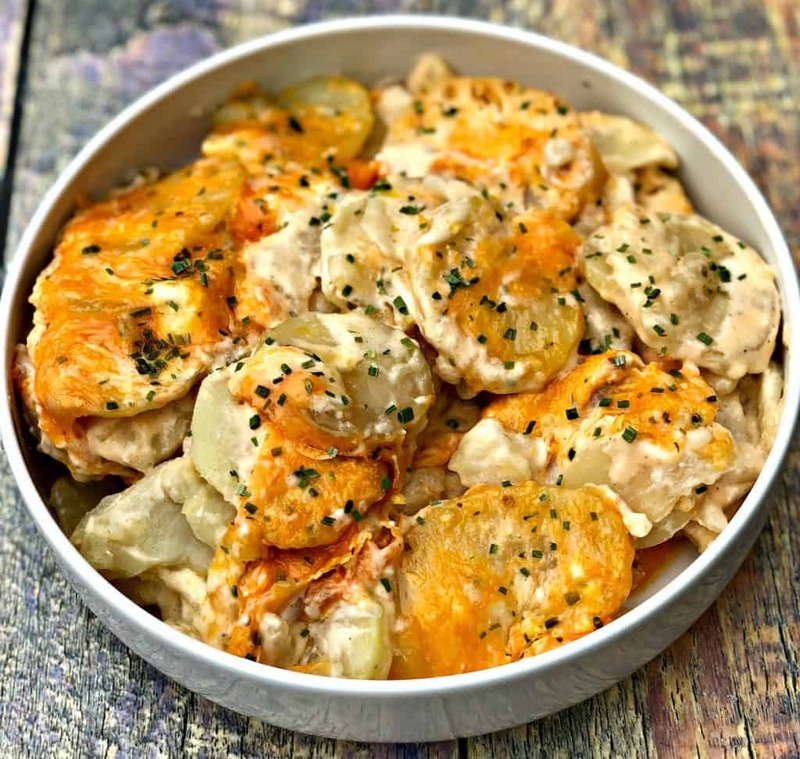 The savory garlic flavor worked perfectly for scalloped potatoes! The Kraft website also had a lot of recipes written up that utilized the cooking cream. 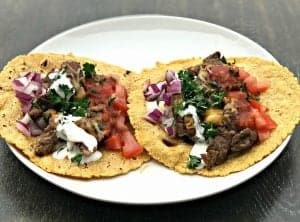 My early experiences with cooking are from using the recipes on their site. When the cooking cream vanished, I was on my own to figure out a substitute. I love potatoes! I love all carbs! I had to replace the recipe! I use broth to give the potatoes flavor and to help soften them up. Using broth was a part of my method well before the Instant Pot, but I knew it would work perfectly in the pressure cooker. 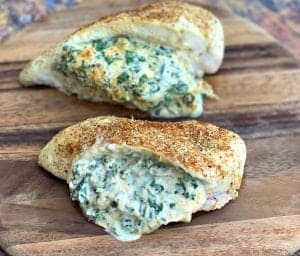 Have you ever made shredded chicken in an Instant Pot using broth? It’s truly amazeballs. I also still use cream cheese. 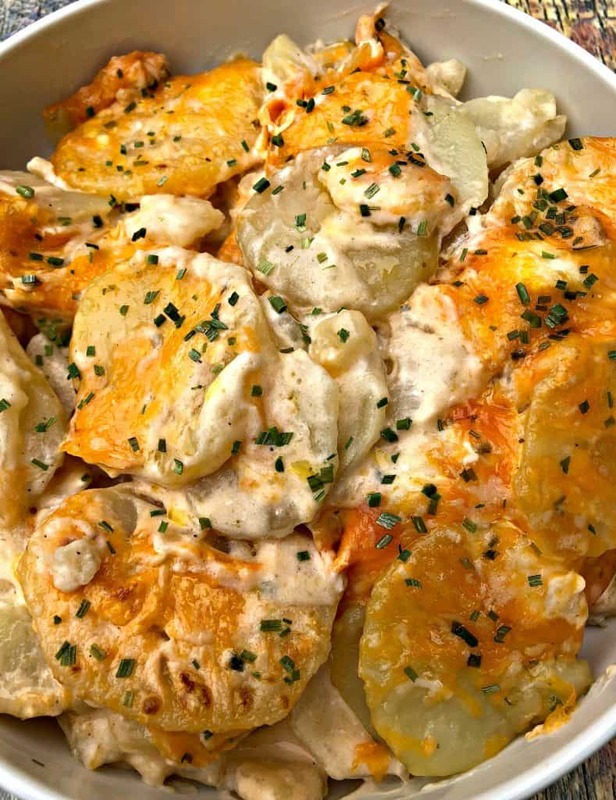 The cream cheese makes these potatoes soooooo creamy and of course a little more cheesy! Another one of my favorite ingredients is parmesan reggiano. It can be expensive. So if you are fine with just using cheddar cheese, by all means… go for it! Feel free to omit the parmesan reggiano. I usually catch it on sale at my local grocer. I buy up a few blocks in bulk and freeze them. With oven baked scalloped potatoes, it can usually be a struggle to determine how long the potatoes need to bake in order to become soft. You also have to add the cheese at the perfect time, so that it doesn’t overcook. 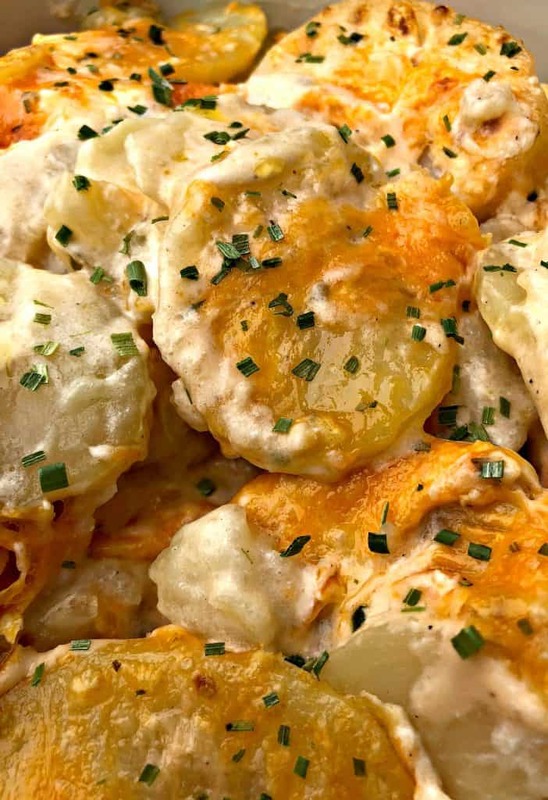 Scalloped potatoes need gooey cheese. With the Instant Pot, cook time for potatoes is dramatically reduced. The potatoes only need a few minutes to cook. Then you add the cheesy goodness and broil it all for 3-4 minutes until the cheese melts. I use a mandolin to slice up potatoes. 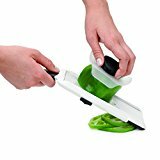 This mandolin slicer from Amazon works great. Be sure to check out step by step video instructions below! Slice the potatoes into rounds about 1/4 an inch thick. I used a mandolin. Add the potatoes to the Instant Pot with the chicken broth. While the potatoes cook, prep the remaining ingredients and preheat the oven to broil. When the Instant Pot indicates it has finished, quick release the steam. Open the Instant Pot. Remove the potatoes and place them in the baking dish. Hit cancel on the Instant Pot and then Saute. Add the garlic to the pot and cook for 1 to 2 minutes. Add the milk, cream, salt, pepper, and onion powder, 1 cup of cheddar (save 1/2 cup), the parmesan reggiano, and cream cheese to the pot. Stir continuously until the cheese and cream cheese have melted. Drizzle the potatoes with the liquid mixture. Sprinkle the remaining cheddar throughout. Broil for 3-4 minutes until the cheese has melted. Remove the pan from the oven. Sprinkle the chives throughout. I purchase block cheese and shred it myself using a grater. I do not use pre-shredded cheese because it does not melt as well as block cheese. Because chicken broth is used to cook the potatoes, I did not use much salt in this recipe. The broth has salt. Use your judgement in how much salt you would like in the dish. 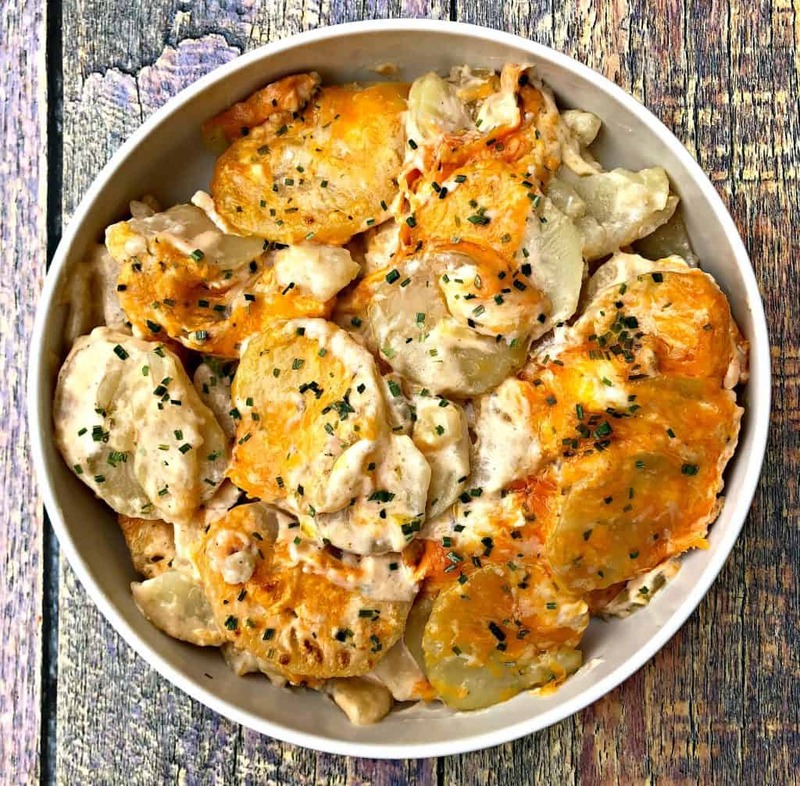 Oh I love scalloped potato, I didn’t know it can be made in an instant pot, gotta try! To make a double batch, would you just double everything? I know doubling the liquid for pressure cooking is sometimes a no-no. Would you double the chicken broth or no? 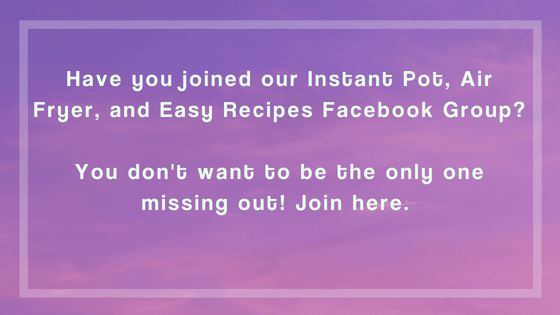 Can you double the recipe in the instapot? 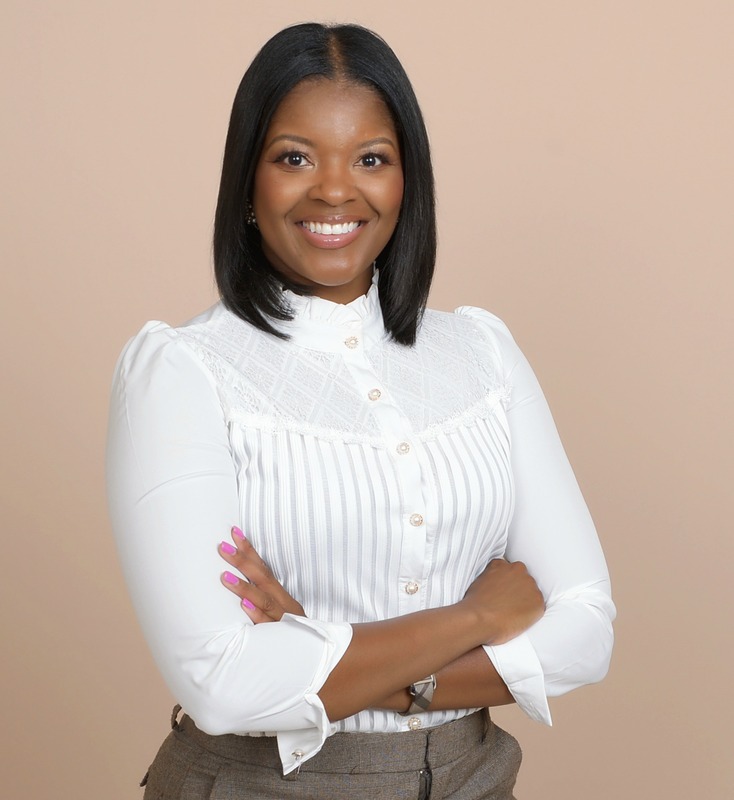 It would be so nice if you would add email to your way to share. Thank you! Your recipe sounds delicious. 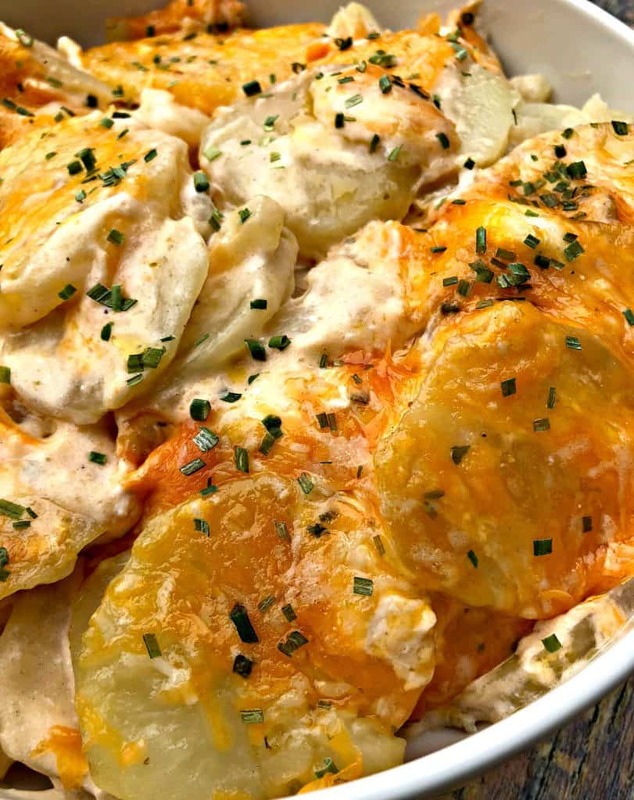 We love scalloped potatoes at my house, but I agree with you that baking the potatoes in the oven can make it difficult to determine when they are done. Also, in the oven my cheese sometimes gets curdled and is not smooth, as it should be. 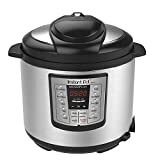 I will be trying this soon, since I have recently purchased an Instant Pot (and I love it!). Thanks for the recipe. I want to make the potatoes and then have it go to keep warm for about 4 hours. Do you think that will work? I’ve never tried that. I would think the potatoes would soften and potentially fall apart. Since I’ve never tested it I’m not certain. 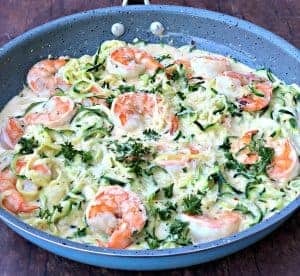 I just used my Instant Pot for the 1st time with this recipe and it turned out amazing!! Thank you!!! You’re welcome! I’m glad you enjoyed it. I hope you try more recipes. I’m assuming mild cheddar cheese?? Doubling the recipe call for double the liquid? Mild or sharp whatever you prefer. You can try doubling the liquid. Drain any excess. We are making ham for Easter and I was looking for something different and this looks like it is it! I sometimes make scalloped potatoes in the oven but it is hard to judge how long especially while roasting with a ham. This is great because I can put it in the oven for a few after the ham comes out 🙂 I just have to figure out the rolls now. Maybe I can put the potatoes in the oven a little lower of a temp on convection and cook a little longer to melt so I can do the rolls at the same time.